The essential probabilistic tools needed in order to obtain some important results in stochastic calculus have been presented in the preceding sections. 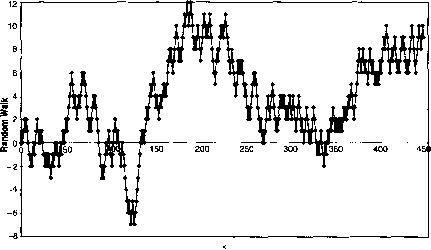 Since the most powerful of these results (Ito's lemma) can only be obtained under the assumption that the filtration representing the accretion of information is generated by a very special process, namely a Brownian motion, a brief review of the fundamental properties of the latter is presented in this section. The topic is well covered in virtually all the texts in stochastic calculus: see, e.g., Oksendal (1995). The conceptual layout of this section and the following owes a lot to Shreve (1997). 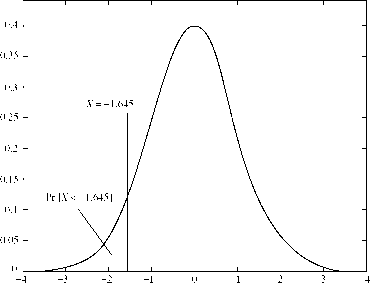 (i) Take a given probabilistic 'experiment', and label its outcomes, a>k, by an integer k, where k = 0, 1, 2... (i.e. the outcomes can be thought of as 'occurring at time fc'). (ii) For each integer k, to each possible outcome, cok, a random variable Xk(a>) can be associated. This random variable can only assume, depending on the particular elementary event cok occurring at 'time' k, the values of +1 and — 1. Let the sum of the probabilities of the events at time k to which there corresponds the value for the random variable Xk of +1 be Similarly for the events associated with Xk = — 1. (iii) Let each realisation be independent of the previous one. To lighten notation X(k, cok) will also be denoted in the following as X(k, a>) or simply X(k). The simplest example of 'experiment' could be the tossing of a coin, or the realisation of an 'up' or 'down' move on a binomial tree. The 'experiment', however, need not necessarily have only two possible outcomes: the rolling of a dice could constitute a possible 'experiment' if one associated, say, the value +1 to any even outcome, and the value —1 to any odd outcome. The second condition requires that the coin or the dice should be 'fair' (unbiased), or that the 'up' and 'down' probabilities should be equal to \. The third condition requires that the outcome of the 'experiment' should not be influenced by previous outcomes. The values of ±1 for the random variable Xk justify the term 'unitary' for the random walk, and the 'fairness' of the experiment characterises the random walk as 'symmetric'. In addition to these properties, let us assume that the filtration 5 is generated by the random variable Xk. since Xk+i can only assume the values of +1 or —1, and use has been made of property (A.l). In other terms, the best prediction that can be made after n realisations of the value that a symmetric random walk will assume after s realisations is simply its value after n realisations. Var[/?W„ = E[(RWn - /?Wm)2|&] - (E[(RWn - Wm)|&])2.
where use has been made of result (A.3) concerning the variance of X, and of the fact that successive realisations are independent. Figures A.5 and A.6 show the realisations of a unitary symmetric random walk and of a scaled symmetric random walk with m = 3, respectively.